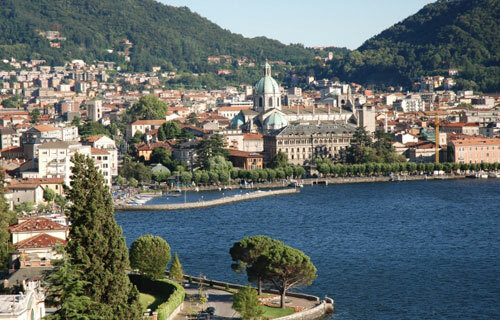 Como is the principal town and it gives its name to the whole lake. It lies in a green dell surrounded by hills of glacial formation, at the southern end of the West branch of the lake. Impressive are the geometrical outlines of the historical centre developed inside the ancient Roman encampment. 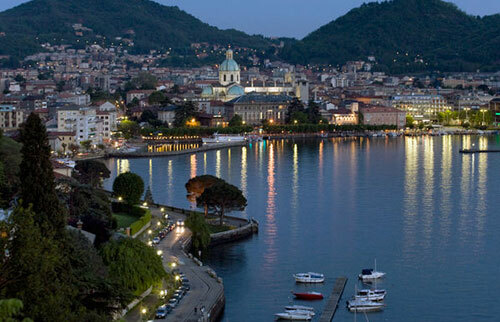 The city itself centres on the modern Piazza Cavour, which opens onto the lake and divides the lakeside promenade into eastern and western sections. A rail junction and tourist centre, Como is noted for its old established silk industry. It is the site of the National Institute of Silk, with large workshops, laboratories and vocational-training facilities. The Broletto building, an ancient Council house, was built in 1215; then following a fire in the fifteenth century, it was modified and mutilated in 1396 to make room for the cathedral. The stately monument is the result of efforts made, over a period of three centuries, by a group of artists from Como. Both its planimetry and decorations indicate the passage from Gothic to Renaissance. The tripartite façade is adorned by windows with one light and by an impressive rose window of stained glass dating back to 15th and 16th Centuries. 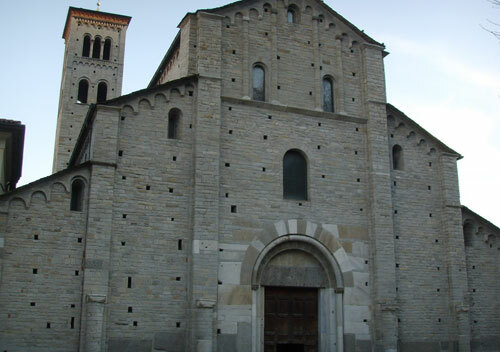 The Sant'Abbondio Basilica was built in a perfect Romanesque style, in the second half of the eleventh and twelfth centuries. It is located outside the city walls and is near the historical centre. It is probably the most outstanding monument by the maestri comacini who have been able to fuse the Cluniacense, Norman and Renan traditions to the Italian one. This basilica has two bell-towers, with northern European canons on the second and forth apses. 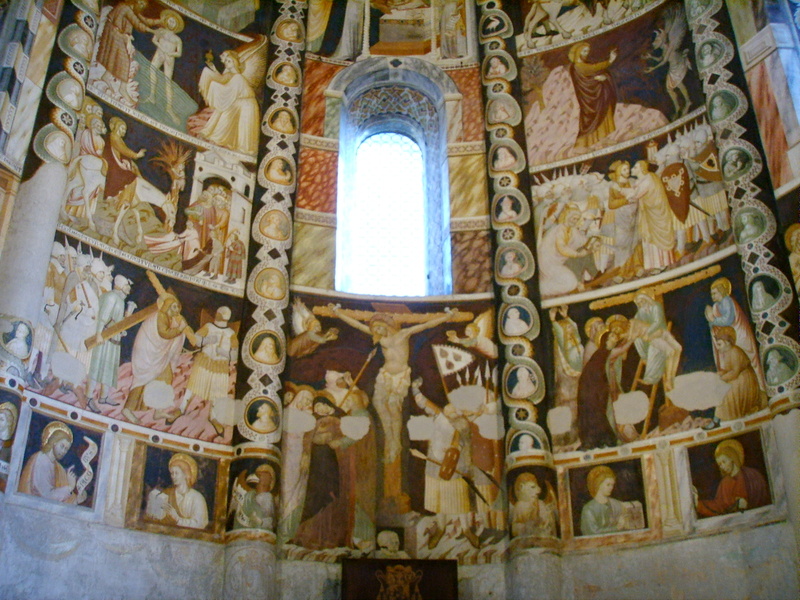 The interior is characterized by a presbytery that ends up in a semicircular apse beautifully adorned with frescoes representing the life of Christ, that date back to 1300. 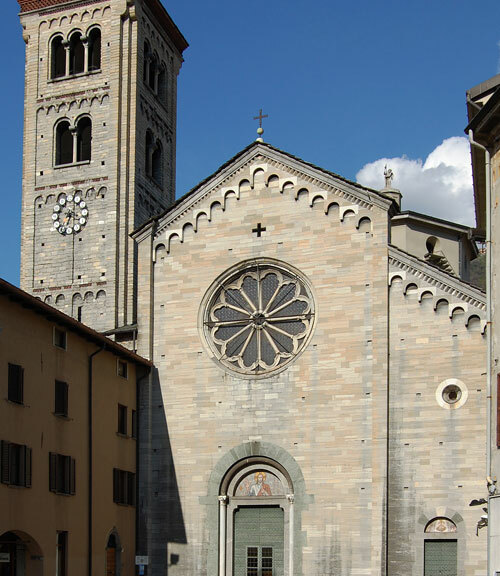 The Sant'Abbondio basilica may be considered the archetype of the Romanesque style, in fact the crucial elements of this style have been exported all over Italy and Europe by the architects from Como. 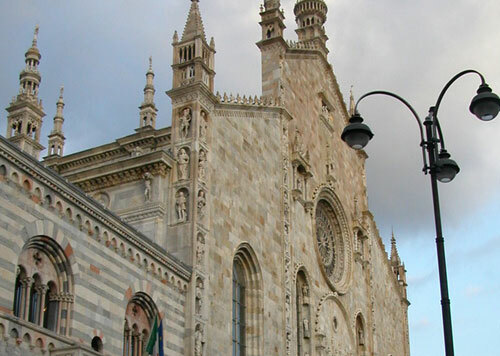 The San Fedele Basilica was built during the eleventh and twelve centuries in a Romanesque style by the maestri comacini, who became famous all over the world for their unique artistic skill and devotion. This basilica has an incomparable structure. It develops from a typical mausoleum and baptistery plant to a combination of both a basilical planimeter and a central scheme. 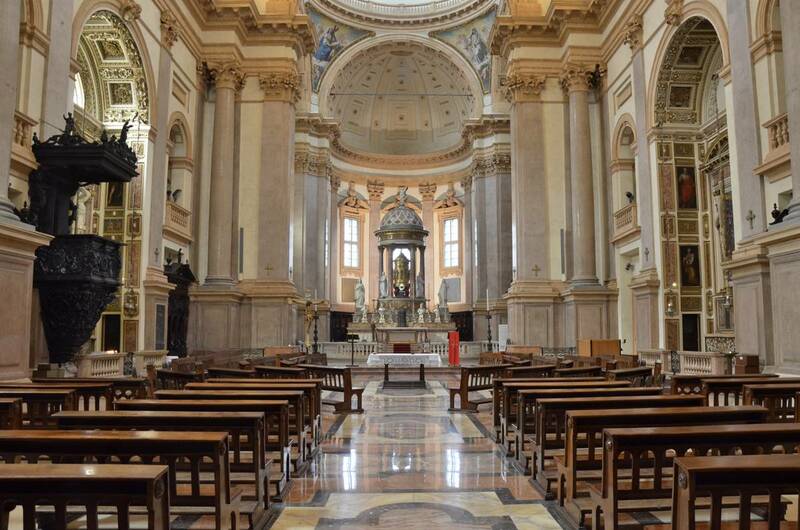 The most interesting part of this Basilica is the apse with its elegant loggia. The nave and the two aisles end up in an elliptical body surrounded by a women's gallery. The interior, like the exterior, is decorated with statues, alto-rilievo works, decorations and valuable works of art. On the very top of the facade is the rose window realised in 1509 and on the side is the Romanesque steeple adorned by mullioned windows with two or three lights.